A rhinoplasty is an aesthetic treatment used to change the look and shape of the nose. Furthermore, it may help repair a functional or breathing issue in many patients. Ashburn, VA board-certified plastic surgeon Dr. Michael J. Brown is an experienced cosmetic nose and facial surgeon who performs rhinoplasty surgery, taking a conservative approach for soft and natural results. Although rhinoplasty consists of delicate changes, results tend to be beautiful and dramatic. Cosmetic nose surgery at The Loudoun Center for Plastic Surgery can be recommended to make a nose appear smaller in size or change a nose that is misshapen, protrudes out, is too large or wide, or has a bump on top. The objective is to allow for a more aesthetically appealing nose that meets your cosmetic desires and functions well. 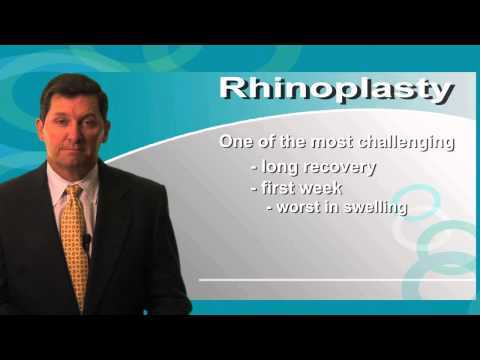 Receive more information on rhinoplasty before you contact The Loudoun Center for Plastic Surgery to schedule an appointment for a consultation. "I don’t even know where to begin! This center has exceeded my expectations! I had a breast augmentation done in February and I absolutely love my results! From the front desk to the Nurses, Anesthesiologists and most importantly Dr.Brown my experience was awsome! I will definitely be going back again for another procedure in the upcoming months ??" "I had a breast lift with Dr. Brown 10 years ago. I love his new office and the staff is very friendly. I loved my results and will be recommending him to all my friends." "I had a good feeling about this place from the moment I walked in. The staff are phenomenal and Dr. Brown himself is absolutely amazing. He understood my case, was very clear in describing my procedure, and even post-op has been very communicative and supportive to ensure that my recovery is going as smoothly as possible. But not even just him, everyone there has been with me every step, even going so far as coming in on days off to ensure that I was taken care of. If I could have given more than 5 stars, I would." "I had the pleasure of working with Dr. Brown and his incredible staff. Being a self-proclaimed over-thinker that is anxious about all things medical, I found them to be professional, patient, thorough and compassionate every step of the way. Kat and Pam always made me feel welcome, and I couldn't have asked for a better nurse than Melissa. I was referred to Dr. Brown by a friend, and am so glad that I followed her advice. I would recommend Dr. Brown without hesitation!" "I had an amazing experience with Dr. Brown and all of his staff at The Loudoun Center for Plastic Surgery. From the moment I walked in the door, I felt comfortable, informed and in good hands. Dr. Brown gave me exactly what I wanted, and I couldn't be happier with the results. I receive compliments all the time and I owe it to Dr. Brown. If you are considering plastic surgery or dermatology services, I highly recommend The Loudoun Center for Plastic Surgery." Adults and teenagers over 16 years of age are candidates for cosmetic nose surgery. If you find yourself frustrated with the appearance of your nose and have distinct issues you hope to improve, enhance, or correct, this procedure may be the recommended course of action. It is very important that expectations are understood as your nose and facial profile will be altered. Furthermore, facial growth and maturity should also be complete. This will be addressed during your consultation, even more so for adolescents. Nose surgery is performed while the patient is under sedation, such as general anesthesia, and is in most cases an outpatient procedure. This treatment offers different surgical methods, depending on the unique cosmetic goals of the patient. 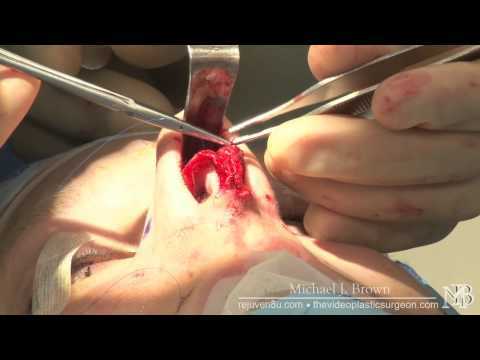 Dr. Brown performs rhinoplasty using either an open or closed (endonasal) approach. The objective during the procedure is to decrease or eliminate excess bone, cartilage, and tissue, or to build and increase cartilage if necessary for reconstruction. The nasal features are repositioned, and the skin is draped over the newly structured framework. Stitches are positioned either on the inside portion of the nose or within the natural external fold. Upon completion of your cosmetic nose surgery, you will rest comfortably in the recovery section, and then our nurses will release you to recover at home. The nose and the surrounding area will be swollen, bruised, and sore for the first few days. In almost all patients, there is some discoloration beneath the eyes in addition to the nose. Consistently using cold compresses and anti-inflammatory medications can assist with these effects. Your post-op check-up with Dr. Brown will be scheduled within 48 – 72 hours after surgery to assess your healing progress. It takes around 2 – 4 weeks to look normal following nose surgery. Within this timeframe, strenuous exertion should be avoided. The cost of rhinoplasty varies based on what technique is used and how complex your procedure is. Before estimating costs, Dr. Brown will listen to your concerns and goals to help develop your custom treatment plan. When this is done, he can discuss costs for the facility, anesthesia, and more. For your best results, it is important to focus on selecting an experienced surgeon, like Dr. Brown, instead of the lowest cost. To help make your surgery as affordable as possible, The Loudoun Center for Plastic Surgery accepts several payment methods, and our office can help you find low-interest financing. Will my insurance cover functional nose surgery? Although rhinoplasty for cosmetic reasons is not paid by insurance, functional rhinoplasty that is medically necessary to improve your breathing may be covered. If you may be applying for reimbursement from your insurance, please tell Dr. Brown in your consultation. We can help you submit any needed information and paperwork to your insurance to process your claim. Are there nonsurgical options to change my nose? If you want to smooth lumps and bumps on your nose, a wrinkle filler (like Restylane or Juvéderm) might be an option. A filler can temporarily improve minor imperfections, which might help you decide to get a rhinoplasty. Nose surgery is better for larger changes, long-lasting results, and to adjust the internal structure for better function. At your consultation, Dr. Brown can tell you more about nonsurgical nose reshaping. Ethnic rhinoplasty is about improving the nose while still keeping your cultural identity. This is often a concern if you are African-American, Asian, or Middle Eastern. In your consultation with Dr. Brown, you can talk about what you want to keep and what you want to change. This will allow him to personalize your treatment plan to give you your best results. Can I combine nose surgery with other facial surgeries? Some patients think about combining rhinoplasty with another procedure, like cheek or chin augmentation. Having multiple surgeries for a dramatic result can be reviewed during your consultation with Dr. Brown. Once he understands your goals, he can help you choose which procedures will be in your custom plan. Rhinoplasty can help your whole face appear more balanced so you should wait to see your results before getting another procedure. Nose surgery is a great option to address the distaste you might feel when looking in the mirror at your appearance. If you are dissatisfied with the size and shape of your nose or if you suffer from breathing problems, nose surgery may help. Nose surgery is a popular cosmetic procedure with very high success rates. Dr. Brown aims to improve your nose so your entire face appears more attractive and proportionate. Even minor adjustments can lead to an impressive difference. We encourage you to get in touch with The Loudoun Center for Plastic Surgery in Ashburn, VA to schedule an appointment.